One of the most significant works of art in the Victoria and Albert Museum is the plaster cast of Michelangelo’s David (Repro.1857-161) by Clemente Papi (1803-1875). David has recently received an enormous amount of worldwide media attention around the removal of the protective shroud that he has worn while the Cast Courts have been renovated. 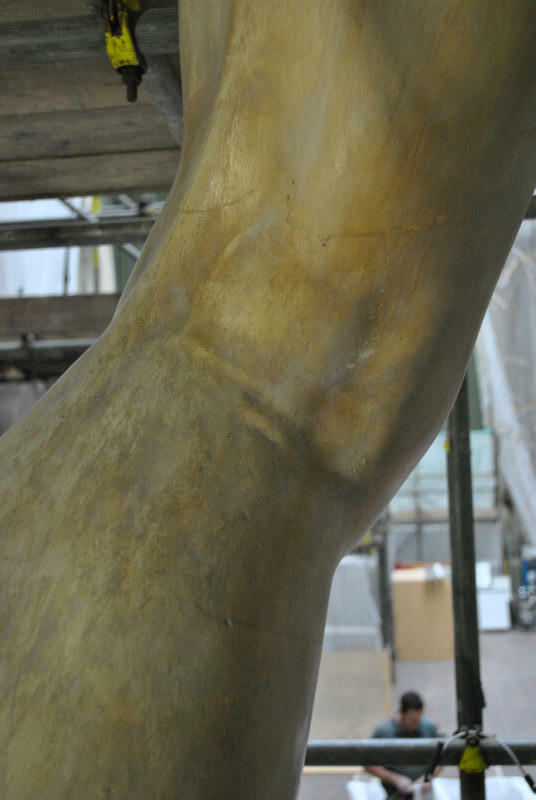 Having been given the honour of caring for this colossal naked figure, I have at last completed my conservation treatments to remove the layers of dirt and stabilise the painted surface. David is finally ready to face his admirers in pristine condition in the beautifully refurbished gallery space where he stands on a freshly redecorated plinth, with his notorious fig leaf displayed at the back. 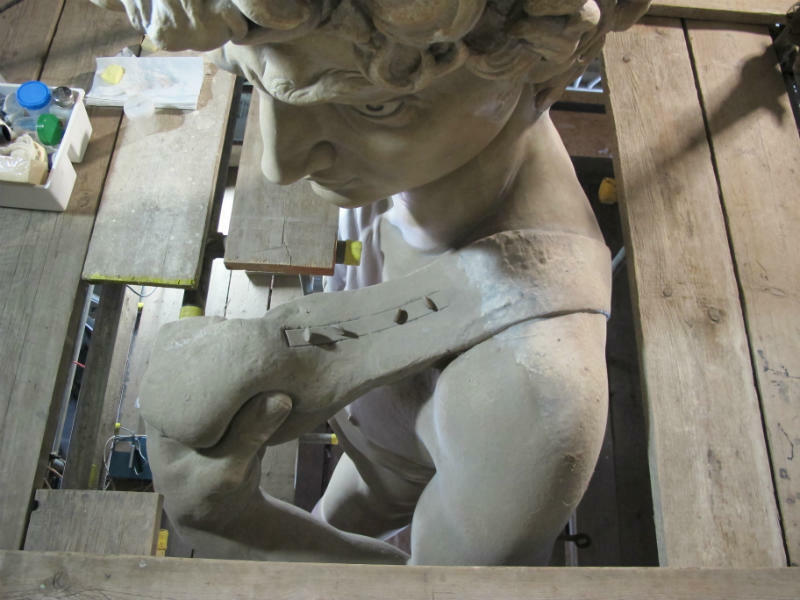 Surrounded by other copies of Michelangelo’s masterpieces, David’s new central position dominates the space which is filled with other casts of Italian monuments and sculptures, all of which have also undergone conservation treatment. To give you an idea of how I treated this famous figure, I will share with you some of the discoveries I have made about the cast and its history, and whom I have been collaborating with so far. 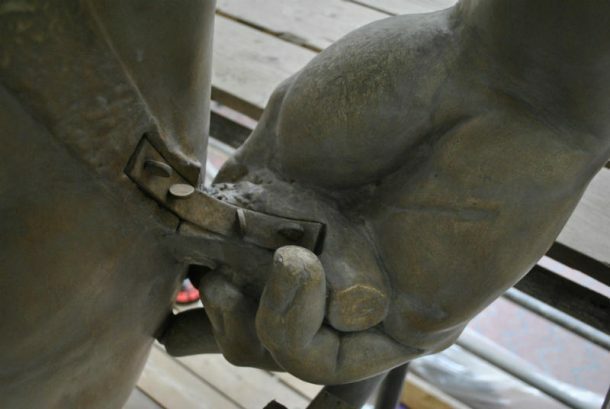 Metal fixings on the back of David’s right hand. © Johanna Puisto Victoria and Albert Museum, London. If David was a gift to the Queen, then why did he end up in South Kensington instead of the Royal Collection? Since my previous post Uncovering Michelangelo’s David I have spent some time investigating the reason behind the Grand Duke’s gift, which is briefly explained in the description of David’s fig leaf. Apparently the Grand Duke presented the cast to Queen Victoria to show his ‘extreme regret’ that circumstances had in his opinion obliged him to interpose a veto upon exportation of a picture by Ghirlandaio, which the National Gallery wanted to acquire. However, Her Majesty received no private word about the gift from His Royal Highness and the crates in which David travelled to England were directed by the Home Office to South Kensington. 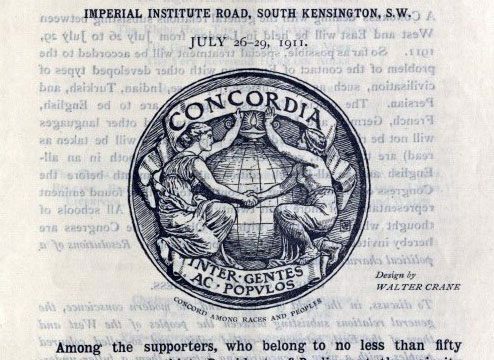 I was curious to find out more and I searched the Home office on line records and Victoria’s journals trying to find an answer, but I only found a reference to a bronze copy of the David in Queen Victoria’s journal on 25th March 1888. After seeing a bronze copy of Michelangelo’s statue in the Piazzale Michelangelo in Florence, she writes, ‘I do not admire it’. Curious to know whether the Queen did in fact admire the original marble by Michelangelo or was it merely the copy that she did not admire, rather than the original, and what did she think of the plaster cast in South Kensington, I wrote to the Royal Archives to ask whether they had any record of the gift? 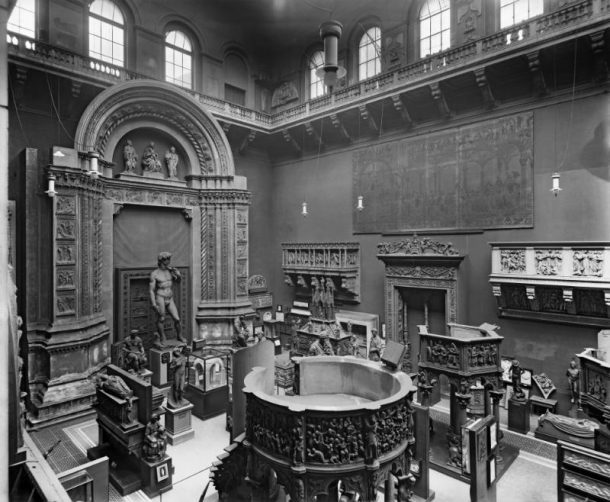 They kindly searched their nineteenth century records, but unfortunately found no reference to the gift by the Grand Duke of Tuscany to Queen Victoria of a plaster cast of Michelangelo’s David, its transfer to the South Kensington Museum, or Queen Victoria’s views on this copy or the original. Sadly the Prince Consort’s diaries do not survive so they were unable to find out whether the gift had a special meaning to him. However, the search is not over and there are many other diaries and historic resources to discover and I will keep you updated on what else I will find out about David’s past. 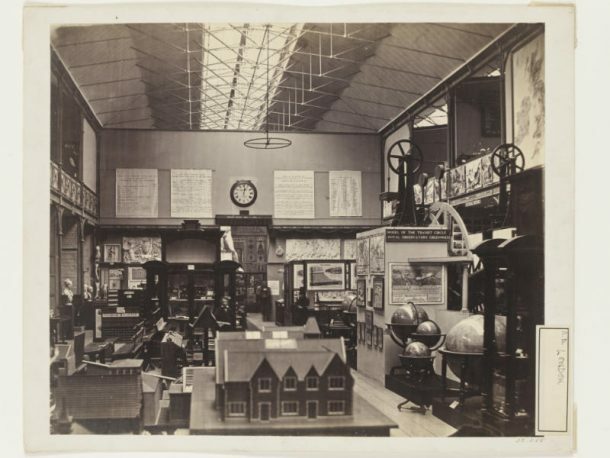 David visible through the doorway in the South Kensington Museum in the 1850’s. © Victoria and Albert Museum, London. A while ago, by coincidence, I bumped into Richard Cook, a former head of sculpture conservation, in the museum’s science department, which he happened to be visiting. Richard used to work in the sculpture conservation studio back in the 1970s and he was the last person to clean David in the 1980s. 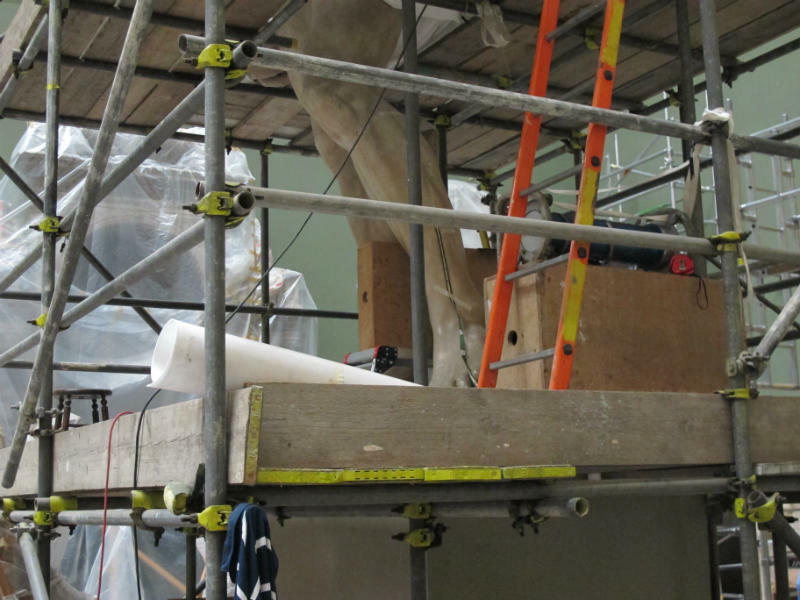 I invited Richard to climb onto the scaffolding surrounding David to have a close look at the figure, which he had carefully cleaned several times in the past. He also explained to me the processes and materials that Papi would have used to create the moulds and the cast and suggested that Papi might have used olive oil or soap as a sealant or barrier layer when taking the moulds from the original marble. Apparently olive oil and soap were commonly used as a sealant in Italian piece moulds before pouring wet plaster in to the mould. Sadly the original mould, which Papi made, was destroyed. I wondered whether the conservators in Italy had found any soap or oil on the original marble when they cleaned and studied it in the beginning of this century. David looking rather grubby in the 1920’s. Notice the museum’s old gas lighting in the ceiling. © Victoria and Albert Museum, London. Plaster can be a real challenge to clean due to its porosity and delicate nature so when they were made, many of the casts were coated with various materials to protect them and to make cleaning easier. 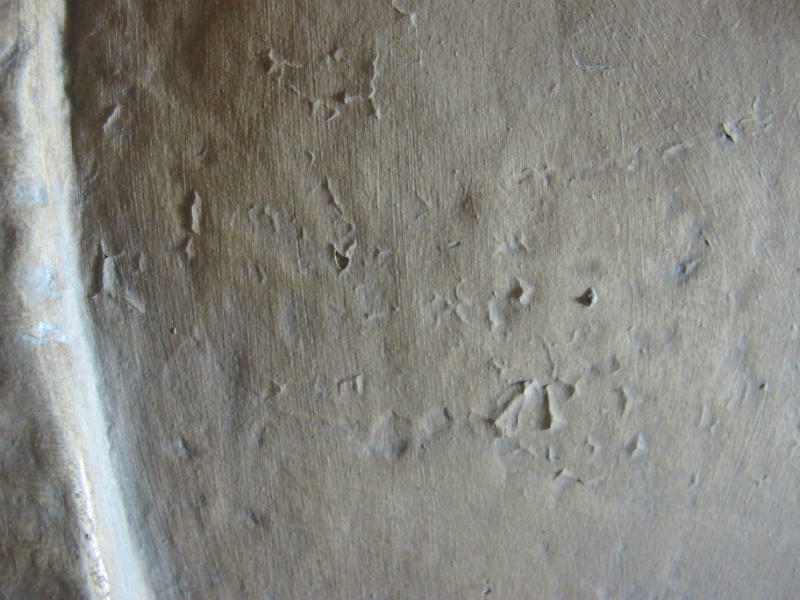 Plain plaster can be easily dissolved by water and overzealous cleaning which can lead to dirt being easily trapped into the ‘pores’ of damage. This ingrained dirt can be very tricky to remove. Luckily, cleaning David ended up being a relatively easy task because he had been painted and waxed in the past. Thanks to the museum’s scientists Dr Lucia Burgio (Lucia’s blog) and Dr Brenda Keneghan who both analysed samples taken from David’s surface I was able to understand what the surface coatings were and therefore choose a suitable method for removing the dirt without damaging the cast. A rather grumpy looking David being partially dusted and surrounded by tools and equipment. Notice the fixings on top of the sling. © Johanna Puisto Victoria and Albert Museum, London. Cleaning David’s toes. © Johanna Puisto Victoria and Albert Museum, London. I began by removing a thick layer of dust that had accumulated particularly over David’s shoulders and head. After he was dusted, I removed the remaining dirt with cotton wool, specialist sponges and purified water. The sponges I chose are used for cleaning wall paintings and other delicate surfaces. They are extremely soft and absorbent, but can be squeezed almost dry, which is important if you want to introduce a minimum amount of moisture to the surface. As I was cleaning the cast, I found numerous areas of peeling and flaking paint.There are many ways to consolidate paint and so I tested multiple materials and methods to find the right solution. After careful consideration, I decided to treat the cracked paint using the following method: I applied a small amount of water and alcohol with a brush onto the damaged area to ‘relax’ the paint and allow the adhesive to flow into the cavities. After a minute or two, I applied the adhesive, which was a weak acrylic solution. After the area was saturated, I then gently pressed the peeling paint flake back into its place with the aid of a heated spatula. This treatment was very time consuming and I had to be really careful to avoid cracking the paint or pulling it out. Peeling and cracked paint on David’s back to the right of the sling strap. © Johanna Puisto Victoria and Albert Museum, London. While treating the surface, I thoroughly inspected the cast to see what else might be revealed. I discovered a number of historic repairs, dents and other surface hairline cracks which I left as they were once it was established that they were stable. I also noticed imprints of cracks on the original marble since the time the cast was made in 1856. While checking the condition of the legs I noticed unusual cracks on both of them. The cracks didn’t always run along the joints like the hairline cracks and I was worried that the legs might be unstable. I wondered whether the plaster or possibly the internal metal armature (framework) might have got damaged or destabilised at some point during the various moves of the cast in the last 157 years. Back of David’s left leg showing cracks above the knee.© Johanna Puisto Victoria and Albert Museum, London. I asked the museum’s X-radiography specialist Paul Robins whether he could recommend a non-intrusive way of investigating the structural stability of the figure. 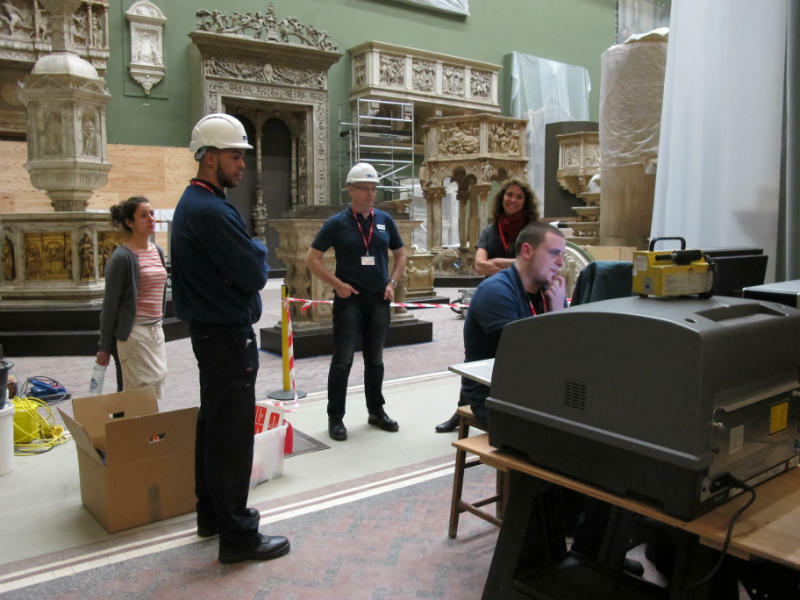 The museum has it own X-radiography facility that is big enough to accommodate large paintings such as the ones that Constable made, but the machinery could not be transported to where David was. Paul recommended approaching a company with a portable X-ray machine that may be able to carry out a radiographic inspection in situ. 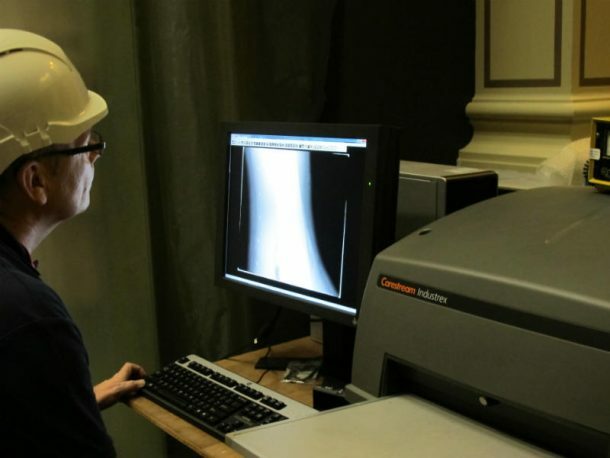 We found a company, Intertek NTD , that had plenty of experience in carrying out x-rays on a number of unusual things. They informed us that the exposures had to be taken in the evening, when the museum was closed, to ensure that people in the surrounding areas would not be exposed to radiation. X-ray specialists and conservators working in the Cast Courts in the middle of the night. © Johanna Puisto Victoria and Albert Museum, London. We managed to get a team of radiographic specialists in just before the scaffolding around David was dismantled and spent an exciting night in the museum watching them X-raying David’s legs. 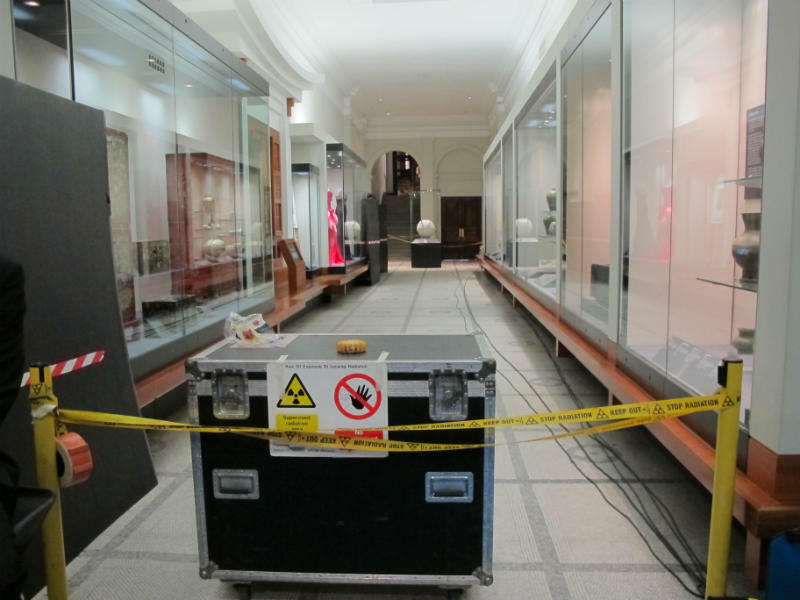 As a health and safety precaution we barricaded the most immediate zones around entrances to the gallery. We placed yellow warning lights by the barricades and notice boards advising people to keep away. Barricades with warning signs and lights set up in a gallery adjacent to the Cast Courts. © Johanna Puisto Victoria and Albert Museum, London. Before each exposure was taken, the equipment would make a loud warning sound and we would quickly leave the gallery, take our strategic positions guarding the entrances making sure that no one would enter the space while the exposures were carried out. In between each exposure we analysed the digital images. Andy Saunders from Intertek NDT analyses the digital images on a computer screen. © Johanna Puisto Victoria and Albert Museum, London. We discovered that David had two bars of metal armature supporting the insides of his legs, placed in a similar way to a human leg bone. David’s left leg ready to be exposed. The tape measure attached with low tack tape helps to keep track when exposures are analysed. © Johanna Puisto Victoria and Albert Museum, London. 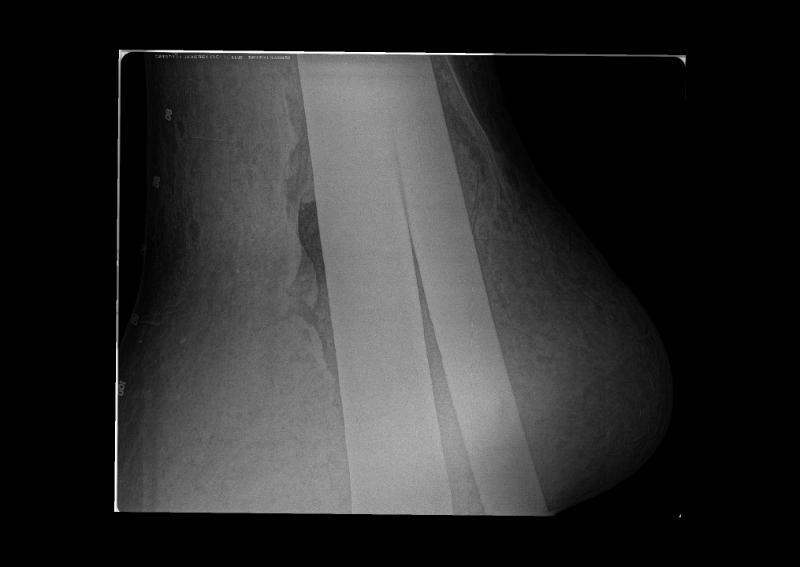 X-ray showing two metal bars inside David’s left leg. Image © Intertek NDT. 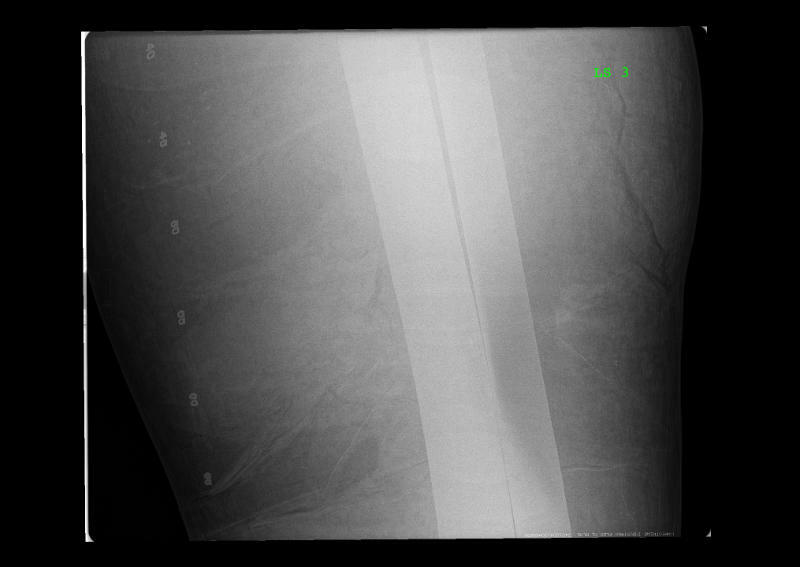 X-ray image of David’s left foot showing the metal armature penetrating into the base. 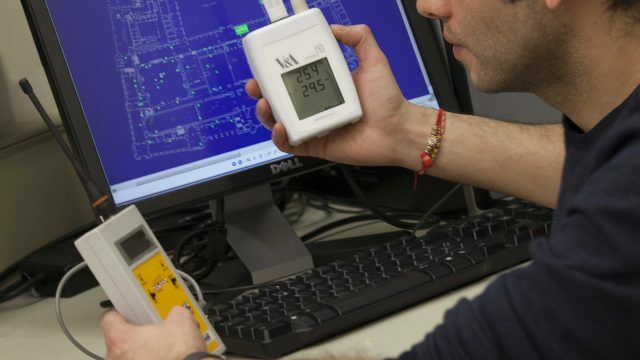 Image © Intertek NDT. We also discovered that the legs were solid plaster rather than hollow and although we couldn’t take exposures of the entire figure due to funding and time constraints, we reckoned the arms were also solid, but the torso was hollow. According to the images, the cracks on the legs turned out to be cracked paint and none of them seemed to be going deeper than the painted surface, which was good news. 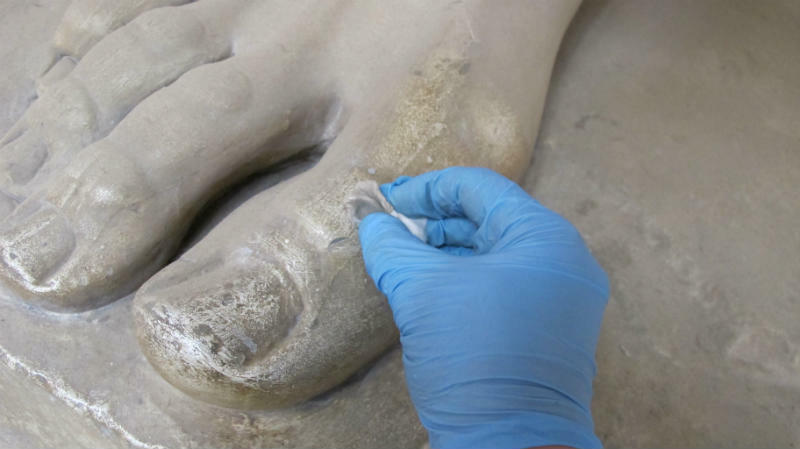 Occasionally we found cavities, such as in the left ankle, which were probably large air bubbles and could have formed when the plaster was poured into the mould. Sharing knowledge about the two David’s with a curator from the Pushkin State Museum of Fine Arts. I have been determined to collaborate with other institutions who own similar casts. The Pushkin State Museum of Fine Arts in Moscow, Russia has a similar cast of David in their collection and I managed to get in touch with the Curator Irina Skoptsova from the plaster cast collection of the Old Masters’ Art Department. 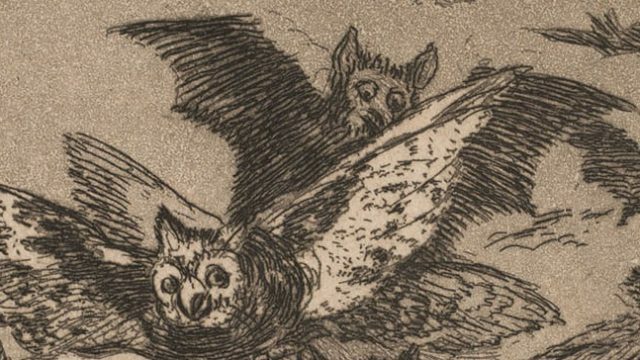 Since then we have been exchanging information regarding our Davids and we have also shared information regarding how to care for our collections. Not long ago Irina travelled to London and I invited her to the V&A to see David and to meet our Senior Sculpture Curator, Marjorie Trusted. After a really interesting discussion about the similarities between our collections we clambered on to the scaffolding and I described what I had discovered about our David and how I had treated him. Irina had previously sent me detailed images of their David, which I had examined with great interest. She had also sent us wonderful illustrated books about the history of their cast collection, although written in Russian. I will need help in translating them! You are able to read more about the Pushkin David as I have invited Irina to write a guest blog, which will be published soon after this. Also, watch out for my next post about David’s long forgotten nose. Its wwonderful to be here and also to get psn offers and hack is awesome.